As much as your mom loves flowers and gifts, one of the greatest gifts you can give your mother is recognition. At Lamar Advertising, we love giving back. This year, we’re giving you the opportunity to show your mom some love on our digital billboards nationwide for Mother’s Day. 1. 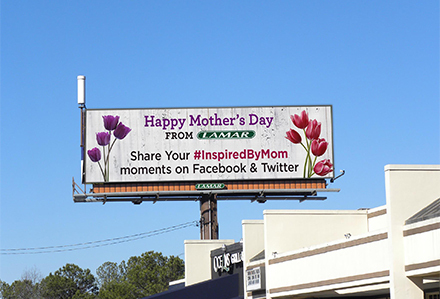 Visit Lamar Advertising Company's Facebook page, upload a photo of you and your mom to our page, tell us why she inspires you, and include the hashtag #InspiredByMom. 2. 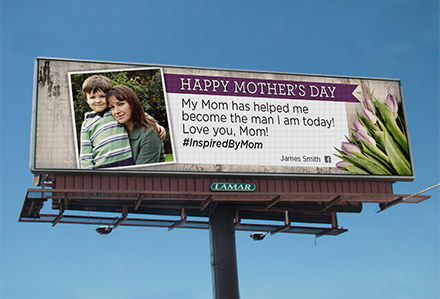 You can also tweet using the #InspiredByMom to @LamarOOH. 3. We'll display your Facebook photo and caption or tweet on our digital billboards across the U.S. - see examples below. 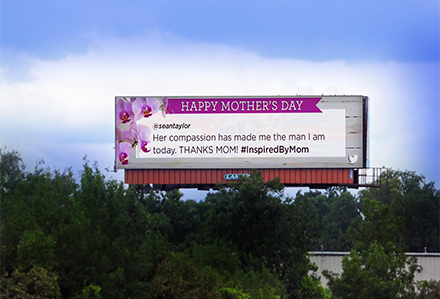 We’ll be streaming the posts/tweets on our digital billboards from May 6, 2014 through Mother’s Day. Lamar Advertising Company (Nasdaq: LAMR), a leading owner and operator of outdoor advertising and logo sign displays, announces the Company’s operating results for the first quarter ended March 31, 2014.